Voting for the Dell Circular Economy People’s Choice Award is open starting January 7! Each year in January we turn our eyes to the Swiss chalet of Davos, home to the World Economic Forum. They gather the foremost political, business and societal leaders to discuss and shape solutions for positive change. 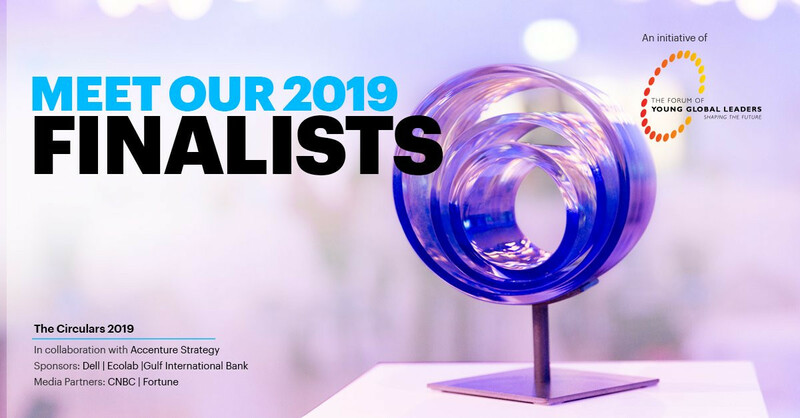 Their group of Young Global Leaders (YGL) focuses on overcoming barriers that stand in the way of progress, and one of their projects has been to support the annual Circulars Awards, recognizing excellence and achievement in the Circular Economy. We believe that it takes ingenuity and collaboration to drive the changes needed for a switch to the circular economy, and the Dell Circular Economy People’s Choice Award is intended to recognize just that. Along with the YGL, we are presenting six exciting companies with innovative approaches. All are deserving, so we want the public to help choose. The dyeing process for textiles can be resource intensive, but DyeCoo has a solution that is water-free and uses no process chemicals. Instead, it actually uses carbon dioxide. Their process is a highly efficient, closed-loop system. By using CO2 under high pressure, they are able to transfer dyes easily and deeply into fibers without generating waste water. They estimate that one of their dyeing machines can save 32 million liters of water (that’s like 55 million Venti coffees). The world is waking up to the challenges created by single-use plastics, especially in food packaging. Ecoware has an innovative solution to that, converting agricultural waste into disposable food packaging that uses no plastic, is 100% compostable in home facilities and biodegrades in 90 days in soil. Their containers are also oil- and water-proof for up to an hour. In addition to avoiding the use of fossil fuels for plastics, Ecoware’s ability to source from agricultural waste gives Indian farmers an opportunity to monetize something they were previously burning, which contributed to air pollution. Ever wonder what to do with old clothes? Discarded clothing occupies 10 percent of landfills. While donation is a great first bet, like other things, these can (and should) be recycled if they are no longer used. Geetanjali begins by taking bales of recycled clothing and sorts by type and color. They are then able to reprocess them in a highly efficient system that uses no dyes, no chemicals and little water. They even have a rainwater harvesting system that serves 35% of their production needs. While many electronics have become indispensable to daily life, there are others that fill a niche or provide a great service that you may want, but not use all the time. Enter Grover – helping break the link between ownership and use. By providing a subscription service for electronics, they allow you to get the equipment you want for specific uses without having to buy it. Vacation of a lifetime coming up? Maybe rent a high-end camera and even a drone. Since 2015 they have recirculated more than 50,000 devices. Triciclos believes waste is a consequence of consumer habits and bad design. More than a recycling company, they are tackling waste at the system level, providing reverse logistics, materials tracking, collection of recyclables via multiple models, design consulting and even environmental education programs. They operate the largest network of recycling stations in South America and have diverted 33,145 tons of recyclable material from landfills. For retailers without strong reverse logistics and returns programs, ZigZag can provide that as a service. They help retailers reduce waste and cost by facilitating exchanges, returns, resale, remanufacturing and recycling – all seamlessly integrated with their customers’ e-commerce sites. Their global reach and multiple warehouse sites enable them to leverage technology and scale to ensure those returns are handled in the most sustainable way. For example, they are able to collect and consolidate returns for batch processing. Each of these companies is bringing innovation and excitement to the circular economy. Now it’s your turn to decide which one should be named the Dell People’s Choice Circular Economy Award winner! Vote here starting January 7. Read more on how Dell and our customers are supporting a circular economy.